We came across this photo today while doing some research on a different historical topic -- it's a circa 1921 photo of what was once known as Steamboat Square on Albany's riverfront. Seeing the boat docked there, and the buildings up against the river, just gave us one of those the-past-is-a-different-place feelings. Oh don't do this to me. Looks like the Livingston Ave Bridge in the distance (to the south). I'd tag DaleyPlanet if I could! Is it Centre and Montgomery Sts? Erie Blvd? It is taking all my willpower not to leave my desk and find this block to see what is left. Where the USS Slater and the Dutch Apple are currently docked is "officially" called Steamboat Square now. 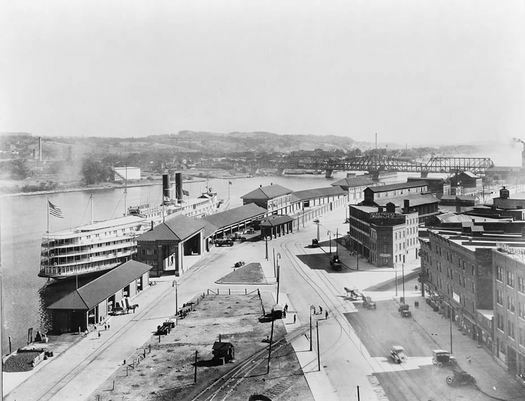 There used to be a bridge at that location, which was torn down and replaced by the Dunn Memorial. Its possible that this photo is roughly where the Corning Preserve is or north of that. Steamboat Square was on the waterfront roughly at the foot of Madison Avenue at Broadway (Which is apparently why the McDonald's at the corner of Madison and Pearl was designed to look a bit like a steamboat). The old Dunn Memorial was built at the south end of it, I believe....at least going from photos from the Morris Gerber collection. There's really nothing left of it now. The historic bronze 1886 Bicentennial tablet noting the original site of Fort Orange was in Steamboat Square, but it's now in on a retaining wall on Broadway under ramps and fly-ways (but at least it wasn't scrapped or lost like so many of them). I'd rather have the Corning Preserve than a ship dock. ...because it's impossible to have both? No, it's not impossible to have both. But without 787 there would be no preserve and when the "if only 787 were never built Albany would be the most desirable city in America" people start to shed tears every time they see a picture like this, it suggests they think we would be better off without the Corning Preserve.